If you're looking for adventure games, this is where to play online slots! The Knights of the Round Table have been summoned by King Arthur to defend their riches. 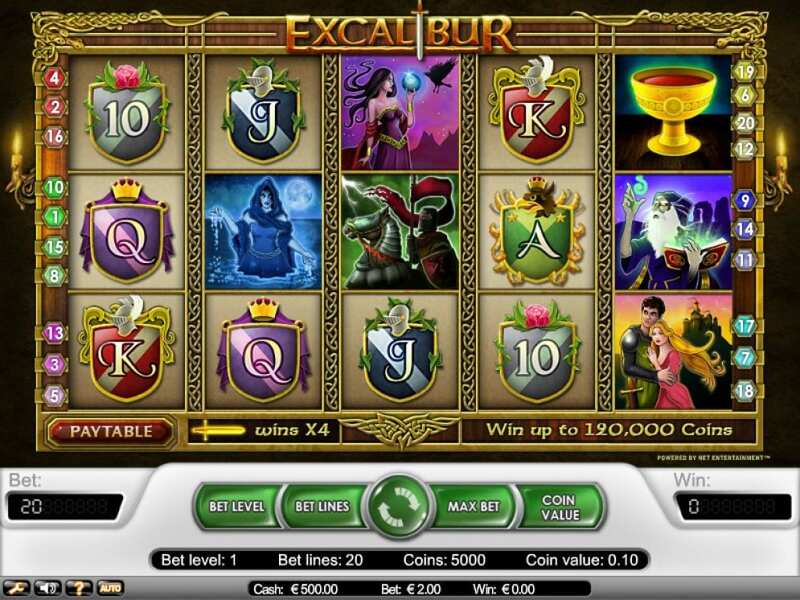 This 5 reel, 20 payline slot casino will soon enough give you the power of Excalibur between your palms. Defeat brave warlocks and suspicious magicians to gain the trust of Arthur and his realm. Deposit and play our slot games today. 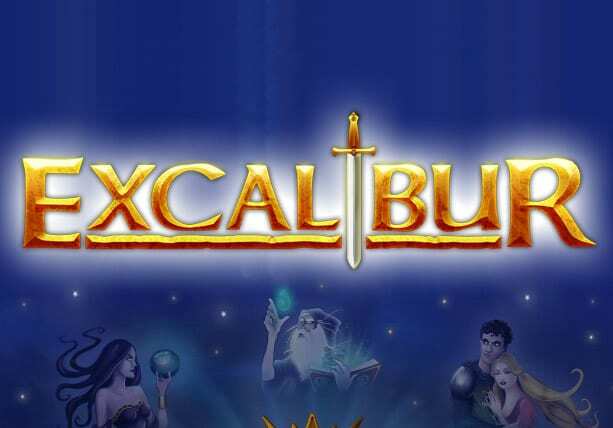 Excalibur is a sumptuous online slot game with 5 medieval reels, 3 exciting rows, and 20-paylines that tie together to create one of NetEnt’s greatest video slots. It’s a legend and history-themed slot with a logical thought process to stimulate your gaming experience. One exciting feature of the Excalibur slot game is a wonderful free spins bonus that re-triggers and multiplier that can increase your stake 3 fold. The game is based, on the Arthurian legend of the Knights of the Round Table. Perhaps this game has made it to the top slots top play for new players! Will you pull the sword from the stone or will you walk away empty-handed? The reels are framed by an ornate gold surround and a medieval font with a few themed components which compliments this game, including a minimalistic but bold layout for the 5×3-reel grid. The characters are more developed and cover several aspects of the Arthurian legend with Arthur, the lady in the lake and Merlin all making their appearances. The royal playing card icons are displayed on heraldic shields. If you decide to choose the auto-play option to play. You can set this to a fixed number of spins, a fixed cash increase/decrease or even for it to run until the feature game kicks in. This level of control for players is a great feature of this game. The gameplay certainly isn’t bland, beginning with the wild action. Both the wilds are fixed and base itself on the sword in the stone story, they add strength to the low wins in the base game with thanks to a 3x and 4x multiplier for the silver and gold swords. The game is certainly capable of big payouts, due to the games high symbol values, you are required to achieve either the 4 or 5 of a kind combination to activate them. When you do get it, you will feel like the legend of the knights on the roundtable as it will choose you as its spiritual successor and reward you with the king’s ransom in gold! The free spins feature game on the Excalibur slot has either 10,20 or 30 spins on offer and if you hit the maximum allowance the scatter win of 500x your line bet means you are already beginning the feature with more rewards than most other bonus features. See how strong you are and try to pull the famous blade off the enchanted stone and have an honourable game of Excalibur, this game will definitely not disappoint. Merlin and King Arthur are just waiting for you to show them that you’ve got what it takes to become one of the greatest online slot players of them all.